On New Years Day, I hosted a big family dinner, and one of the things that everyone looks forward to are my homemade pies. Well, this year, I wanted to try something a little different, and it actually worked out great, because I ran out of one ingredient and successfully substituted another...or 2, or 3! Ever heard of pumpkin pie with no pumpkin? How about "pumpkin pie" made from yams, carrots, and squash? That's right! This recipe turned out so amazing, with the bright orange color you love in a pumpkin pie, the natural sweetness of the yams, and the healthy benefits of the squash. The easiest part about it, was that I simply thawed out my carrot, squash, and yam purees that I had already cooked in my pressure cooker a month before. Easy squeezy! 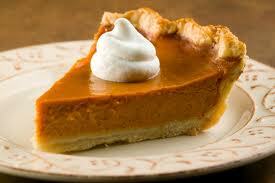 My guests oohed and aahed about the pie, and said it was the tastiest "pumpkin pie" they'd ever had. Here's the recipe. I'd love to hear your feedback if you're brave enough to try it. In fact, I'm convinced once you've tried this recipe, you'll never buy another can of pumpkin again! Cream all ingredients in a mixer on low speed until fluffy and smooth. Pour into prepared pie crust, and bake in a 350 degree oven for 50 minutes or until a knife inserted in the center comes out clean. Cool completely before serving with a dollop of cinnamon cream.